Not surprisingly July has seen our young junior athletes taking all our attention. During the early part of the month, I’m sure that most of us were actively following JWOC from Norway with no indication of what was about to unfold. It’s hard to find the appropriate superlatives to acclaim the outstanding efforts of our juniors on their world stage. Two top ten positions in the Men’s Long Distance, a 1st and 3rd in the Women’s Middle B Final all following Tim Robertson’s superb defence of his JWOC Sprint title. 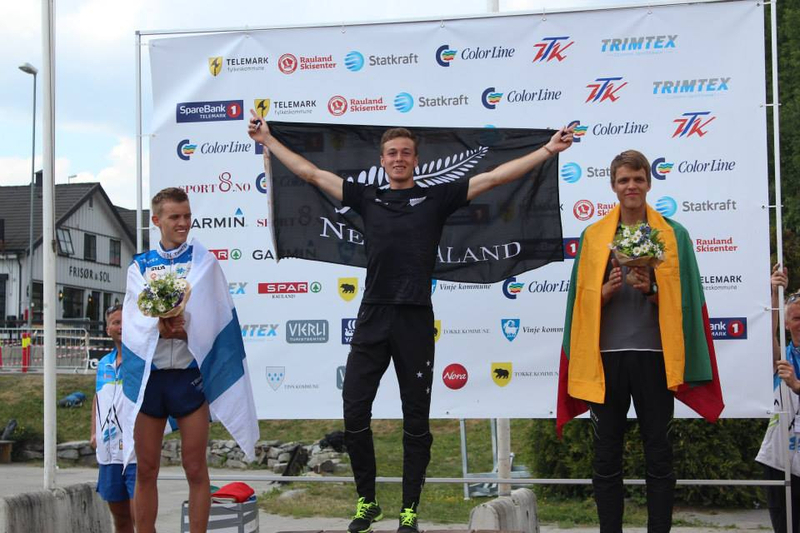 We’ve now witnessed three gold medal performances at JWOC in the last four years! We clearly are doing something right at club and regional level with our training, and the inputs from our elites into junior training are definitely paying dividends. The last weekend of the school holidays saw the NZ Secondary Schools Champs being hosted by Nelson Orienteering Club. I ventured over the hill from Blenheim and attended the Individual Champs and the Relays. It was great to see the enthusiasm and quality of our next generation of junior athletes being displayed. The NOC volunteers with Michael Croxford involved in everything, put on a memorable event which was not without its challenges – first from the weather which served up a combination of fog and mist, brilliant sunshine and cold driving rain and also from a couple of issues with controls at the relays. One aspect which I will remember from this event was the appearance of Kayla Fairburn and Alice Tilley both of whom had rushed back from JWOC to attend the NZSS Champs being their last opportunity to take part in this event. Their overriding desire to attend acted as inspiration for the other more junior competitors. At Council level, we are setting about exploring changes to our Constitution and are seeking your inputs. We have raised some of the apparent areas for change in our monthly newsletters – so please take the time to provide feedback (club and/or individual) on these important issues as they affect the way we govern and manage the affairs of ONZ and ultimately our sport. The other key focus which continues is Auckland World Masters Games and Oceania – both scheduled for Easter 2017 – and this will increasingly dominate our time as we work towards this date. Finally good luck to all competitors participating at WOC based around Inverness and the Moray Firth in Scotland during the beginning of August. Congratulations to Michael Wood & Nick Collins who have been appointed to the Rogaine Committee. We invite all members to part of this review process. If you have any ideas, suggestions, feedback please forward these to gm@orienteering.org.nz. Please note the following area embargoes are now in place for the Auckland World Masters Games 2017. Want to learn the art of Controlling Orienteering events with ease? Orienteering NZ free controllers clinics are for you and your club mates. Whether you’re new to Controlling for your club or ONZ registered and experienced, IOF controller Marquita Gelderman will help you. She’ll help you understand the role, understand where to put your time and energy and how to approach decision making. Fun, stress free and satisfying event controlling! Presentations, workshop, discussions and map site practicals over two days. AMP Scholarships is about helping bright, passionate New Zealanders to succeed, no matter what their thing is. And as an important part of our community, we know you share the same goal. Each year, we award up to $200,000 in scholarships, and applications for 2015 are now open. The Organising Committee has decided to have 2 event managers for these two events. While they will work closely together to ensure the Festival of Orienteering is a success, there is a need to have 2 seperate roles. We are also interested in Course Planners and Setters who wish to be involved in either or both of these events. Information will be posted on www.orienteering.org.nz/world-masters-2017/ so keep an eye out there for more info. Don’t forget to follow our international team at WOC.